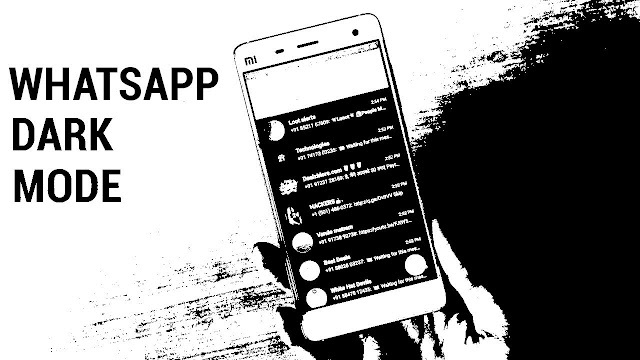 Whats App is going through a transformation as the popular messaging app and from time to time launch new features to revive the application in a fierce competition and a new feature was revealed. The WABetaInfo site has identified a new feature on the trial version of Watts App on Android, iOS and Windows Phone. It is about the "dark mode" feature that will enable users to use the application while relaxing the eyes and save battery resources. WABetaInfo also noted other features, especially with regard to protecting conversations between users by entering a PIN code or fingerprint(fingerprint reader), but without talking about the bio-metric fingerprint of the eye on a number of phones such as iPhone X. ++To apply a dark background to Whats App simply launch the app. ++Tap on the Settings tab from the button bar. ++Tap on Chats > Chat Wallpaper > Solid Colors. ++From the Solid Colors screen scroll down and select the dark grey color. (or any dark color of your choice). ++Finally tap on the ‘Set‘ button to apply the dark wallpaper to the chat screen. ++While using a solid dark background should do the trick, you can also choose to use a custom dark photo by saving it to the camera roll and tapping on the ‘Photos‘ option from the Chat Wallpaper page.